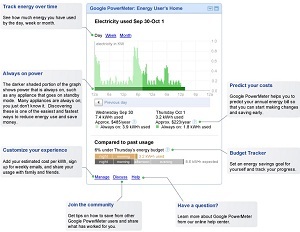 Just a little over two years old, Google’s PowerMeter is heading for the search giant’s dustbin of history. Bill Weihl, Google’s Green Energy Czar, broke the news in a Google blog post, explaining that “our efforts have not scaled as quickly as we would like, so we are retiring the service.” The energy tracking tool is set for its final rest on September 16, 2011. Since that launch in 2009, other energy monitoring and smart metering products and services have been rolling out at a brisk pace, spurred on in part by healthy doses of smart-grid-focused stimulus funds in the US. While Google partnered with a number of utility providers in North America, the UK, Germany, Australia, New Zealand and elsewhere that made the app compatible with their smart meters, it’s now decided to focus on other priorities. In the same blog post, Google also announced it would be retiring its Google Health app as of Jan. 1, 2012, citing the same reason: failure to scale as hoped.